Reading and share top 19 famous quotes and sayings about Imitator by famous authors and people. 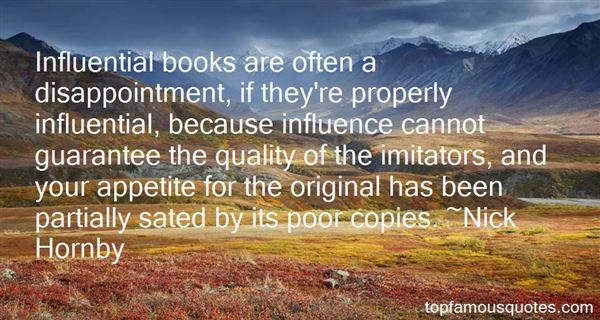 Browse top 19 famous quotes and sayings about Imitator by most favorite authors. 1. "… so that you won't become lazy, but imitators of those who inherit the promises through faith and perseverance. Hebrews 6:12"
2. "Students must have initiative; they should not be mere imitators. They must learn to think and act for themselves - and be free." 3. "Socrates became a trendsetter. Other philosophers, including Plato and Aristotle and Gus, quickly followed suit, dropping their last names too. And, for centuries after that there would be countless imitators including oltaire, Michelangelo, and, much later, Cher." 4. "I rarely play a real person, because I don't think I'm a good imitator." 5. "What gives the artist real prestige is his imitators." 6. "Presently a serpent sought them out privately, and came to them walking upright, which was the way of serpents in those days. The serpent said the forbidden fruit would store their vacant minds with knowledge. So they ate it, which was quite natural, for man is so made that he eagerly wants to know; whereas the priest, like God, whose imitator and representative he is, has made it his business from the beginning to keep him from knowing any useful thing." 7. "It is not imitation that makes sons. 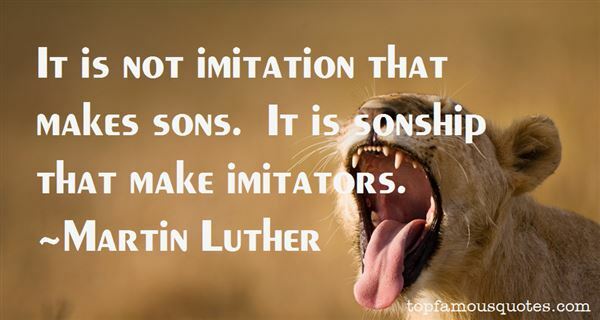 It is sonship that make imitators." 8. "The only known technique to an imitator is to steal and rephrase, then with a mischievous smile, he said, "i did it", without any confidence and prove." 9. "I get to study and I got to mimic and what I basically did was I stole from every person that I could steal from. I was an imitator. That's what I was. It was years before I could take all of these things that I loved about all of these different artists and put them together and find my voice." 10. "Influential books are often a disappointment, if they're properly influential, because influence cannot guarantee the quality of the imitators, and your appetite for the original has been partially sated by its poor copies." 11. "... but now men who could work preferred to beg, and the artists forgot that their calling was noble and became imitators instead of creators, charging exorbitant sums for the rubbish they churned out with one eye closed." 12. "But once an original book has been written-and no more than one or two appear in a century-men of letters imitate it, in other words, they copy it so that hundreds of thousands of books are published on exactly the same theme, with slightly different titles and modified phraseology. 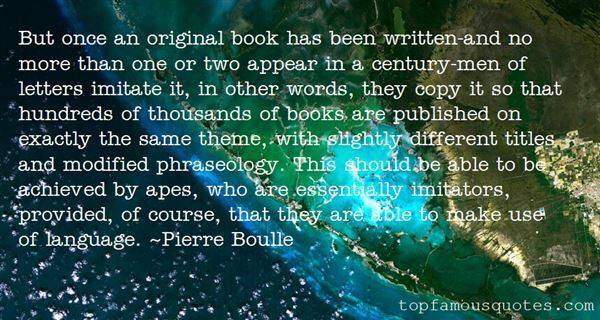 This should be able to be achieved by apes, who are essentially imitators, provided, of course, that they are able to make use of language." 13. "My dear Homer, if you are really only once removed from the truth, with reference to virtue, instead of being twice removed and the manufacturer of a phantom, according to our definition of an imitator, and if you need to be able to distinguish between the pursuits which make men better or worse, in private and in public, tell us what city owes a better constitution to you, as Lacedaemon owes hers to Lycurgus, and as many cities, great and small, owe theirs to many other legislators? What state attributes to you the benefits derived from a good code of laws? Italy and Sicily recognize Charondas in this capacity, and we solon. But what state recognizes you." 14. "If I created a new depravity I would be a priestess, while my imitators would founder, after my reign, in abominable filth...Don't you think that proud men, copying Satan, are more guilty than the Satan of the Bible, who invented pride? Is Satan not respectable because of his unprecedented and divinely inspired sin?" 15. "The imitator dooms himself to hopeless mediocrity. The inventor did it, because it was natural to him, and so in him it has a charm. In the imitator, something else is natural, and he bereaves himself of his own beauty, to come short of another man's." 16. "Be yourself; no base imitator of another, but your best self. There is something which you can do better than another. Listen to the inward voice and bravely obey that. Do the things at which you are great, not what you were never made for." 17. "Now, it is of course well known that Christ continually uses the expression 'imitators.' He never says that he asks for admirers, adoring admirers, adherents; and when he uses the expression 'follower' he always explains it in such a way that one perceives that 'imitators' is meant by it, that is not adherents of a teaching but imitators of a life...."
18. "Muslims must be warned that plagiarists and pretenders as well as ignorant imitators affect great mischief by debasing values, imposing upon the ignorant, and encouraging the rise of mediocrity. The appropriate original ideas for hasty implementation and make false claims for themselves. Original ideas cannot be implemented when vulgarized; on the contrary, what is praiseworthy in them will turn out to become blameworthy, and their rejection will follow with the dissatisfaction that will emerge. So in this way authentic and creative intellectual effort will continually be sabotaged. It is not surprising that the situation arising out of the loss of adab also provides the breeding ground for the emergence of extremists who make ignorance their capital." 19. "You are a Christian today only because God was the first to seek peace with you. You are now called and equipped to be the first to seek after peace and to attempt to pursue and maintain unity. As you do this you have the high honor of acting as an imitator of God." I see a New York where people who are down on their luck can get back on the road to responsibility, a job and dignity."